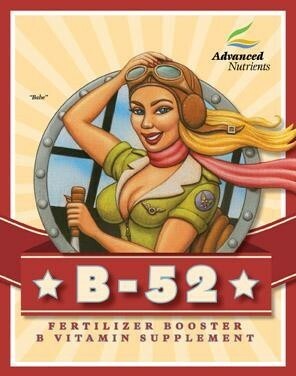 WHEN TO USE B-52: Any time plants are under stress, especially during early growth, cloning, transplanting and flowering. GARDEN TYPES: Rockwool, Coir, Soil, Sphagnum, Ebb & Flow, NFT, aeroponics, aquaponics, vertical stacker, rotary, indoor, outdoor, synthorganic, synthetic. 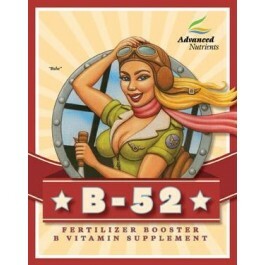 As you can see, B vitamins are absolutely essential- without them, your plants die. Of course, it’s logical to ask if plants can synthesize or derive enough B vitamins from nutrients you feed them. The answer is that your plants can synthesize some B vitamins from nutrients, but they can’t synthesize enough nutrients fast enough to achieve your goals of vigorous growth, earlier maturation, and heavier, more potent harvests. Truth be told, the very same things that make you a superior gardener (by pushing your plants to their maximum potential) also push plants past their natural ability to produce all the vitamins they need for good health and championship performance. So when you provide pre-made vitamins, your plants have less metabolic work to do and they use more of their nutrients for growth and floral production because they don’t have to make their entire supply of B vitamins themselves. Besides, studies show that when plants are fatigued (which is when they most need B vitamins), that’s when they are least able to make their own vitamins. It’s the same as why an Olympic athlete needs a higher-quality diet combined with professional vitaminization, but a person who never exercises doesn’t need such a rich diet or extra vitamins.